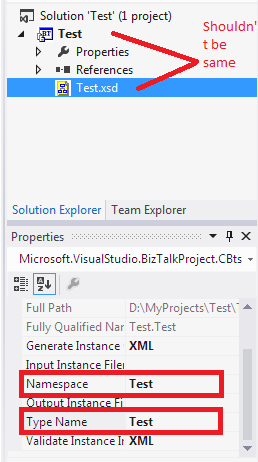 After installing BizTalk 2013, just to check I started to create a project with name as Test. Then added a schema named Test with Root tag named as Test and two elements. Signed the project and tried to build it and following error appeared. To find out the problem, I went through the properties of the schema and found that Namespace and Type name is same. Well I don’t the exact reason but it seems having same namespace and type name causes ambiguity in resolution. Rename the schema and Type Name Or delete the schema and create new schema with name different than that of Project Name.